Part of AMD’s recent pre-announcement of its next generation Rome server processors, using 7nm chiplets and running up to 64 cores, is that the new processors will be compatible with current motherboards on the market. However, one of the new features of Rome is the use of PCIe 4.0. PCIe 4.0 has different standards for on-board signalling in order to get the required speed, so even though the processors are backwards compatible with PCIe 3.0, we expect new motherboards and new systems to be developed with PCIe 4.0 specifications in mind. Today, we saw the first early revision of such a motherboard. This motherboard looks very much like a standard AMD EPYC motherboard. The socket is the same, the DRAM is the same, and almost all the periphery is the same. The most obvious difference is the PCIe slots. On this board, the PCIe slots are labelled in PCIe 3 and PCIe 4 modes Almost all of them say PCIe 4 compatible – this is just listing the peak support, the PCIe 4.0 slots also do PCIe 3.0 with Naples processors. It is worth nothing that the ones nearest the processor are the PCIe 4.0 slots, and the ones furthest away are the PCIe 3.0 slots. This might be down to trace length limits to ensure PCIe 4.0 speeds. 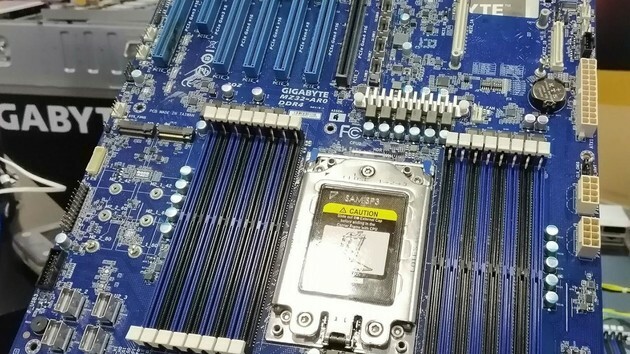 On this board, the primary PCIe 4.0 slot has a different color. This is just to signify the first slot on the motherboard, rather than anything else. Summing up the PCIe 4.0 lanes we get 16+16+8+16+16 = 72, plus PCIe 3.0 x16, PCIe 3.0 x8, and there are two M.2 slots and additional mezzanine slots. When asked, we were told that the power implementation between the Naples and Rome motherboards are the same, with no distinct changes. This was a revision 0.1 motherboard in the works, so the final board might look very different. There are pads for BMC and other features that were unpopulated for example. However I might suggest that the blue color be changed out for a red color? *This piece has been edited. The company has requested that the photos be removed due to a miscommunication. Thank you for helping loved ones transition, for burying them with blessings and honor. You have no idea how much your help has meant.